November is National Lung Cancer Month and Veterans Day. Veterans are joining a "new" war ... The War Against Radon. ... the gas is a particular problem among the concrete military buildings in Okinawa, according to Bill Brodhead. 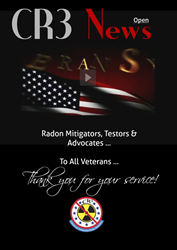 Citizens for Radioactive Radon Reduction announced the November Veterans Day issue of CR3 News Magazine which is dedicated to those who served in the military and now serve as “Radon Warriors.” How is the Military addressing the radon problem with Veteran Housing? CR3 News’ unique look at this issue sends a message, around the world, that our military sees radioactive radon gas exposure as a threat and that The Fight Is On: world-wide! There are radon experts advising the military in the mitigation of veteran housing and providing professional and necessary skills. Their efforts within the radon industry set standards of performance for radon measurement and mitigation professionals world-wide while being radon advocates whose efforts are making a difference and helping to save lives through radon-induced lung cancer prevention. “Our 2018 initiative is to grow the awareness of the danger of living, working, and attending school in environments with elevated levels of radioactive radon and help prevent future radon-induced lung cancer deaths by educating and assisting more radon reduction advocates, to provide legislators with radon facts and data to encourage the protection of their constituents against this silent killer through the enactment of radon reduction policies, to engage the medical communities to seek and participate in endeavors in the prevention of radon-induced lung cancer,” says Gloria Linnertz, Director of Citizens for Radioactive Radon Reduction. Lung cancer is the leading cause of cancer death. The American Cancer Society (ACS) estimates that more than 224,000 Americans will be diagnosed with lung cancer this year, and more than 158,000 lung cancer patients will die—that translates to 433 lung cancer deaths per day in the United States ... http://www.seer.cancer.gov.